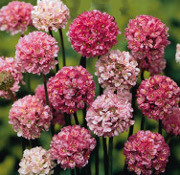 Armeria, also known as Thrift or Sea Pink, is a low growing hardy evergreen plants with green foliage and white, lilac, pink or white blooms. 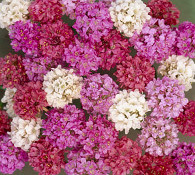 They are used extensively for rock gardens, wall gardens, containers and to cover banks and slopes. 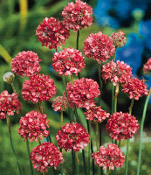 Armeria is happiest in well drained light or sandy soils and least happy in heavy clay soils. 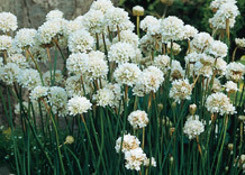 The plants can be propagated by digging existing plants and dividing them or by sowing seed. Seeds should be sown in pots, trays or a bed prepared with a medium of 1 part sphagnum peat to 1 part sand. They should be covered very lightly and kept moist, but not soggy at about 70F. When seedlings are about 2 inches in height, they can be transplanted to larger containers or directly to the garden, if the temperatures do not fall below 65F.